Rome, the resplendent capital city of Italy, is home to great icons of the Western world: the Roman Forum, the Colosseum, the Pantheon and St Peter’s Basilica. Among these magnificent monuments, you will find chic cafés selling fancy gelato and neighbourhood trattorias serving up delicious pasta. Read on to find out what you can’t miss when visiting this great city. Spring (March-May) and Autumn (September-November) are the popular seasons to visit and you can enjoy a range of festivities such as Easter, the Feasts of Saints Peter and Paul, and the Romaeuropa arts festival. The weather during these periods is positively balmy (between 12°C/54°F to 22°C/72°F). Summer (June-August) in Rome is hot and sticky (23°C/73°F to 26°C/79°F). Be aware too that some local businesses close for the month of August. Winter (December-February) is mild and rainy so pack a raincoat with you, but the chill often means shorter queues at major attractions. The best way to get around Rome is on foot, but the city also has an extensive public transportation network of trams, buses, and the Rome Metro. 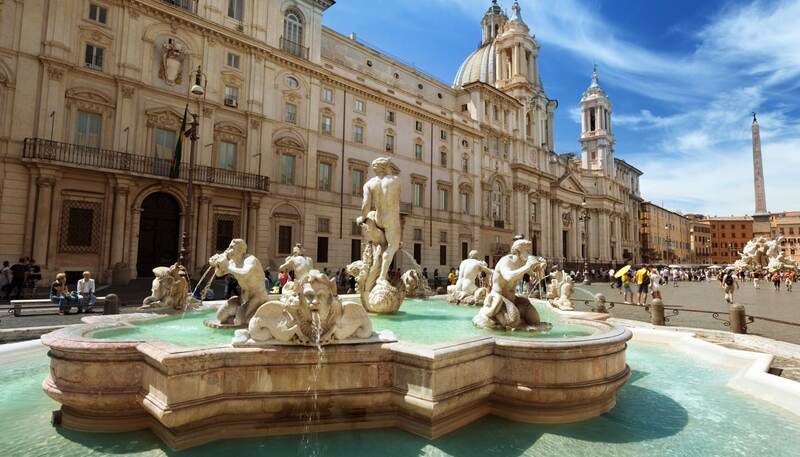 If you plan to visit the numerous museums and monuments, then get yourself a Roma Pass which covers the cost of your travel and gives a discount to major sights. For tips on taxi and bicycle hire, visit our Getting around Rome guide. 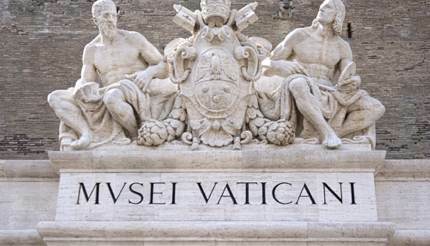 In addition to Vatican City being an independent country, the Vatican houses numerous priceless masterpieces in its museum, as well as the incomparable Sistine Chapel and the gorgeous frescos of the Raphael Rooms. A lasting symbol of ancient Rome, The Colosseum is where the city’s emperors held brutal gladiator shows and wild animal hunts to entertain the masses. Today, it is the most visited monument in Italy. 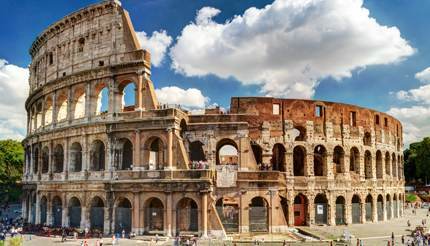 Your ticket to the Colosseum will also let you see the Roman Forum and the Palatine Hill. Both in ruins now, the former was a marketplace, business district, and civic centre of the Roman Empire, while the latter was a residential area for the founding settlers of Rome and the later nobility. The best-preserved building of Ancient Rome, the Pantheon is a statement to the artistic brilliance of Roman architects and the glory of the ancient empire. Although the original purpose of this building is unknown, experts surmise that it was a temple or a place where the emperor made public appearances and addressed the people. Built on the site of St. Peter’s crucifixion, this is the world’s largest and most magnificent basilica of Christianity, constructed under Emperor Constantine’s command around 320AD. Today it holds numerous priceless works of art by such artistic masters as Michelangelo and Bernini. For more ideas on key attractions, see our Things to see in Rome guide. Located beside a large park and gardens favoured by locals, this curious and colourful fairytale house is decorated with motifs of owls. Inside, you will find a collection of over 54 pieces of stained glass, as well as preparatory sketches for stained glass. Located on a Roman archaeological site, the public square where Julius Caesar was reputedly assassinated in 44BC, the area is now inhabited solely by cats. The staff of the cat sanctuary feed and care for the 150 cats that live there, and visitors can stop by to play with the cats or buy cat-themed merchandise to benefit the sanctuary. For other quirky ideas, including where to play a round of golf in a volcanic crater, visit the Things to do in Rome guide. Gnocchi alla Romana – known in English as Roman gnocchi, these dumplings are made from a rich semolina dough. Fiori di Zucca – battered zucchini flowers stuffed with mozzarella and anchovies. Coda alla vaccinara – ox tail, served as a stew or on top of pasta. 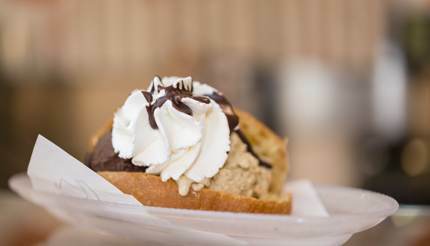 Maritozzo – a sweet breakfast bread roll filled with whipped cream. Saltimbocca – veal wrapped in prosciutto and sage, marinated in white wine. Check out the Restaurants in Rome page for ideas and the best mozzarella bar in Rome. Tipping: Tipping in Rome is by no means required, but if you feel the urge, leave 5-8% of your bill. 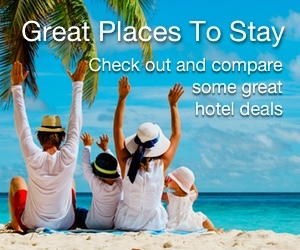 Hotels in Rome are expensive and you will need to look harder for budget options. Hotel D’Este on Esquiline Hill is a reliable bet for budget-conscious travellers; and for guests who want a little luxury, Hotel d’Inghilterra by the Spanish Steps is a great choice. Most bars in Rome offer aperitivo (drinks accompanied by free snacks) between 6pm and 9pm, so find a cosy spot and enjoy your relaxing evening drinks. For club goers, head to the Testaccio and Ostiense districts – as to which clubs are good, check out the Rome Nightlife guide. Americans, British and Canadians don’t need a visa to visit Rome for stays of up to 90 days. However, your passport must be valid for six months beyond the length of stay and issued within the past ten years. For more information, check out the Italy Visa and Passport Requirements page. 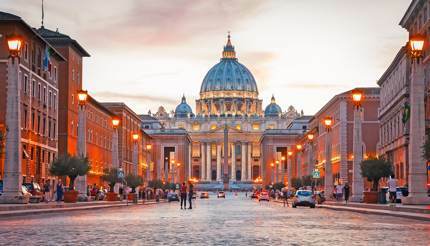 There’s so much to see in Rome – no wonder the saying goes Roma, non basta una vita! (it means “in Rome, one lifetime is not enough”). So plan your trip well by doing your reading up on the Complete City Guide to Rome first.